If a relatively easy hike that still offers some distance and stunning views of rare flora sounds like your perfect afternoon, you’ve gotta check out the Pink Beds Loop hike in Pisgah. 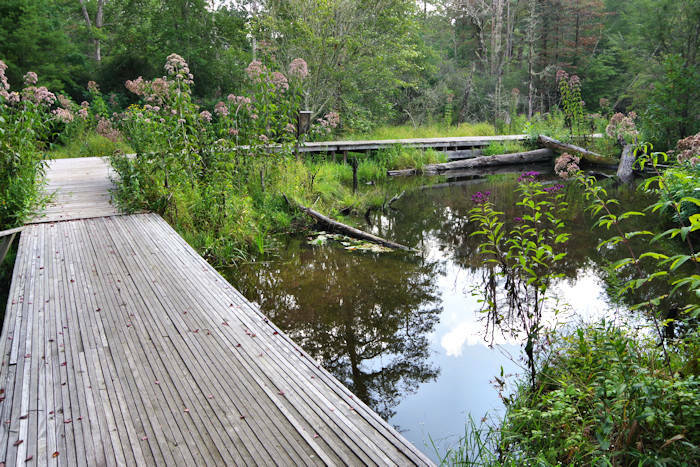 Named after the rare pink swamp lily, this fun and relaxing loop wanders around the bottom of a unique valley with rare mountain bog and American beaver habitat. The trail is flat and takes you through beautiful fern-covered woods and huckleberry patches. Visit in the late spring/early summer and you’ll be able to witness wetlands abloom with pink swamp lilies. A large covered pavilion and open field near the trailhead make a perfect spot for a post hike picnic or friendly game of frisbee. Directions: From Asheville, take I-240 west to I-26 east to exit 40, Asheville Airport/NC 280. Turn right onto NC 280; follow for 16 miles toward Brevard. At the intersection with US highways 276 and 64, turn right onto US 276 west (follow signs for Pisgah National Forest). Proceed on 276 for 11.4 miles through Pisgah National Forest to the Pink Beds Picnic Area, just past the Forest Discovery Center on the right. The trail starts at the signboard at the back left side of the parking lot.